Every year, we are THRILLED when fresh shelled peas arrive at the farmers’ market. When I see them, I buy a pound and then immediately head over to the dairy stand to buy a pint of cream. 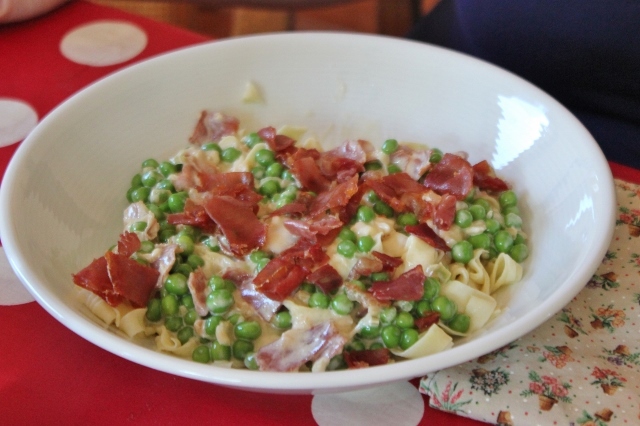 After I get home, I head to our local Italian deli to buy prosciutto, Nik makes the dough for fresh pasta, and we can hardly wait until dinner time to eat our favorite meal of the year: peas and prosciutto. It’s incredibly delicious, perhaps all the more so because we only eat it once a year. 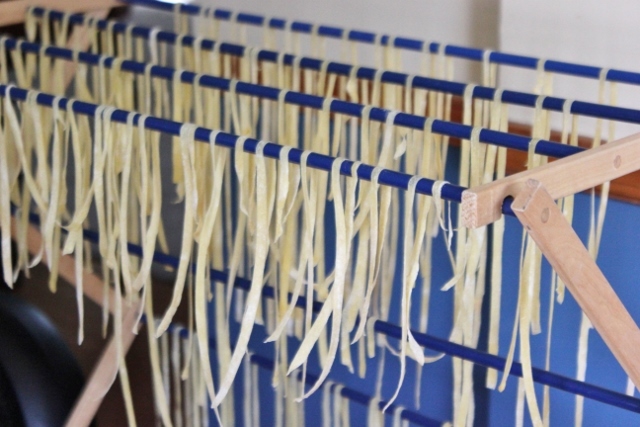 We also only make fresh pasta once a year because it’s so much work. For this dish though, it’s totally worth it. 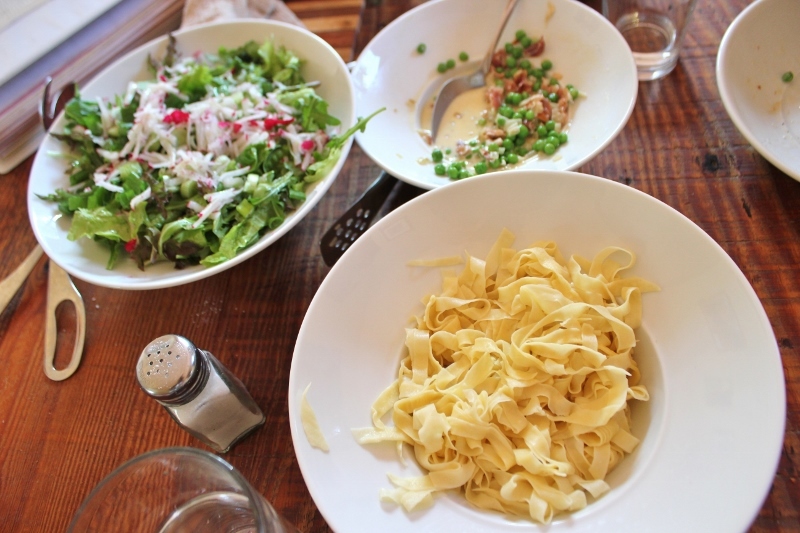 If you don’t want to make your own pasta (and I can understand why – it takes a lot of time), then consider finding some fresh pasta at the grocery story to splurge on just for this meal. This past Saturday, the peas appeared and we had a lovely weekend full of delicious food. 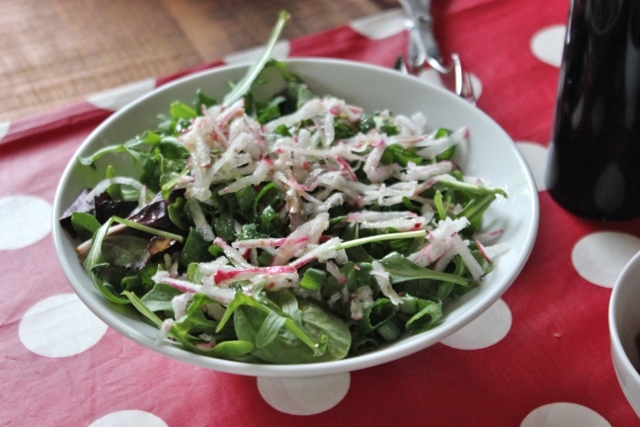 We had enough ingredients to make it twice – on both Saturday and Sunday nights. And now we’ll think of it with great fondness until next year. You haven’t missed your chance though. The farmer told me shelled peas should be around for several weeks. 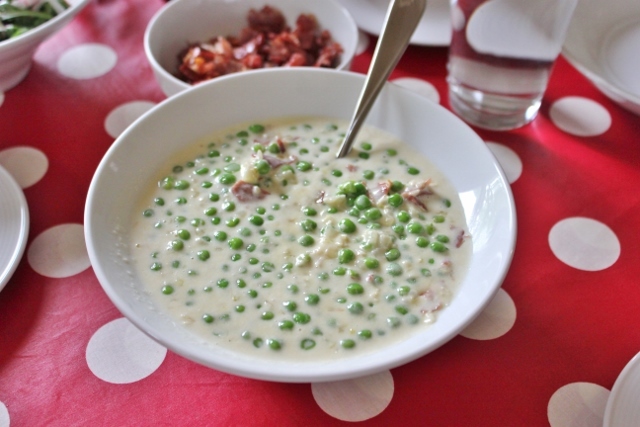 If you don’t have access to fresh shelled peas but still want to make this, I think the next best option would be frozen petite sweet peas although I’ve never tried this recipe that way. 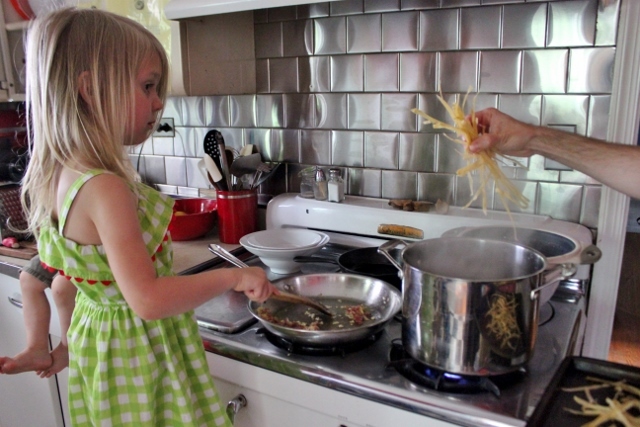 Boil the pasta in about four quarts of water and 1 T of salt. Cook until just al dente, drain, stir in a bit of olive oil to keep it from sticking together and set aside, covered, until the sauce is ready. When boiling fresh pasta, we do it in batches (fishing each batch out with tongs) and the pasta takes approximately the same amount of time to cook as the sauce. Timing proof: Ellie stirring the onions, garlic, and prosciutto while Nik boils pasta. Dice up the prosciutto into bite-sized pieces (as if you were making bacon bits). Set aside about a third of it. Heat a small frying pan until quite hot. Add the prosciutto and fry until it’s nicely browned and crisp. Turn the heat off and leave in the pan to cool until the sauce is ready. While the prosciutto is frying, saute the onion in the olive oil, over low heat until the onions are very soft and just barely starting to brown. Add the garlic and the reserved portion of prosciutto and saute for a couple more minutes until the prosciutto is just starting to brown. Pour in the cream, increase the heat to medium, and simmer the cream until it’s reduced so that a trail remains when you pull your spoon through it. As needed, add a little bit of salt to season the sauce to taste. Prosciutto is very salty so you probably won’t need much. Add the peas to the pan, bring the sauce back to a low simmer, and cook until the peas are bright green and just barely cooked through. This may take as little as 3-4 minutes so start checking them at that point. Mark would have eaten that whole bowl plain if allowed! Taken 6/14/14, last year’s feast day! If you want to make your own pasta, here’s the recipe we use. I’m not going to give extensive directions because there’s a lot out there on the web about the finer arts of making pasta. And frankly, we’re not that good at it because we only do it once a year! This amount of dough made enough for us to eat this for two nights. We didn’t think to weigh the dough ball but my guess is that it makes close to a pound of pasta. Make a mound of flour on your clean kitchen counter (or a very large cutting board). Make a well in the middle of the flour and crack the eggs into it. Using a fork, beat the eggs and begin incorporating the flour into them as you go. As you incorporate the flour, keep pushing up the outside edges of the flour to maintain the well until the eggs are no longer runny. 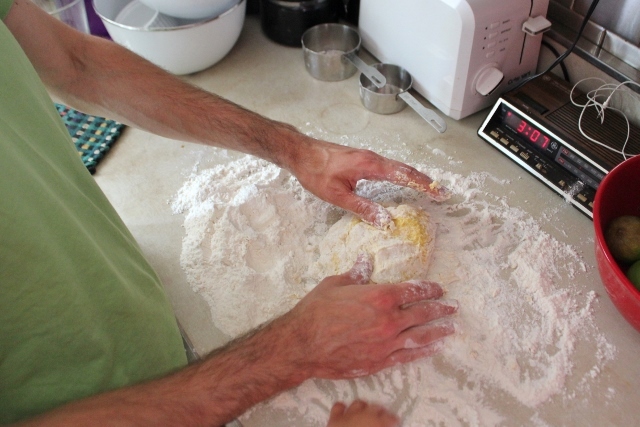 Once the dough has started to come together, use your hands to knead the dough and incorporate more flour until it’s not very sticky any more. 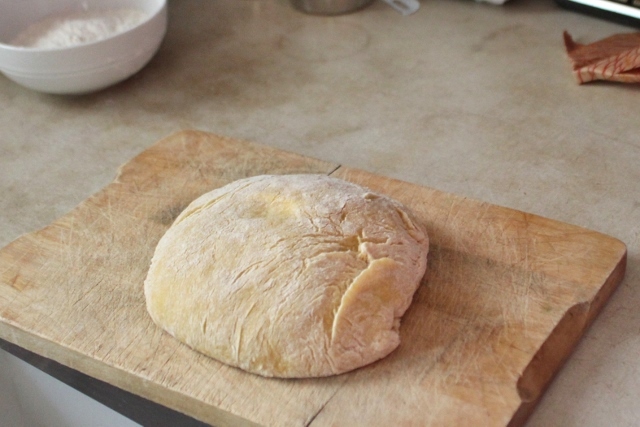 At that point, if there is a lot of flour left, put the dough onto a cutting board and continue to knead it for about 3 minutes, adding flour to the cutting board as necessary to keep it from sticking. Cover the dough with a bowl and let it sit for at least 20 minutes (ideally several hours) at room temperature. If you have a pasta maker, follow the directions to roll and cut the pasta. If you don’t, use a rolling pin to roll out pieces of the dough until they are as thin as you can get them. 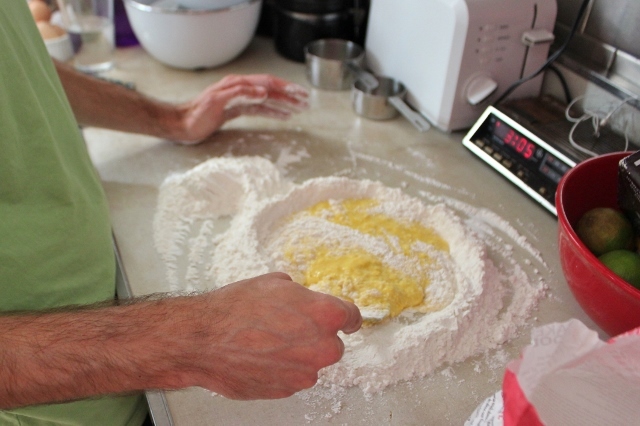 Then use a pizza cutter to cut into fettuccine-shaped noodles. 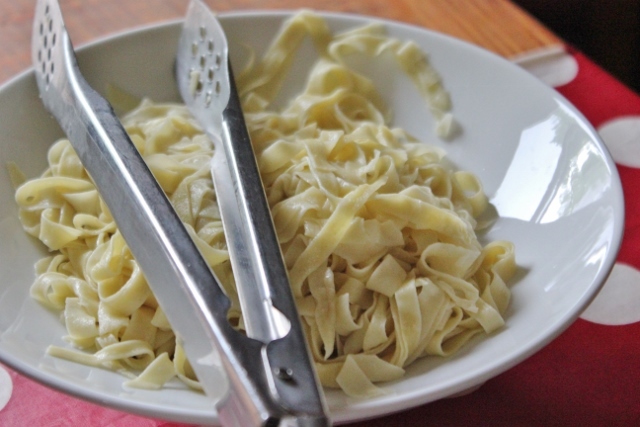 A very kind friend gave us a hand-crank pasta maker and we love it. 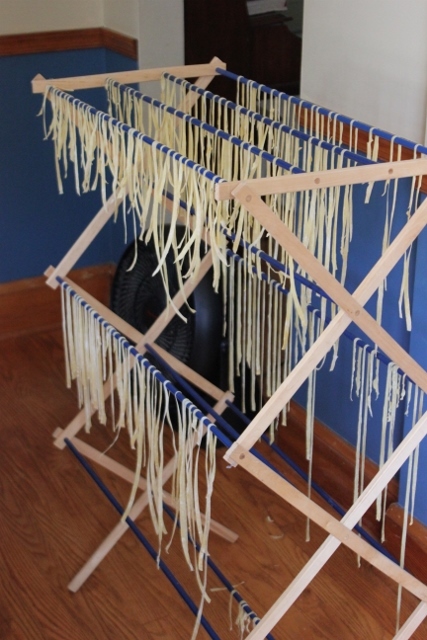 We use our clothes drying rack to let the noodles dry slightly while they are waiting to be boiled. It keeps them from sticking together again before we can get them in the water. Finally, you may be wondering about the cost of such a fine meal. 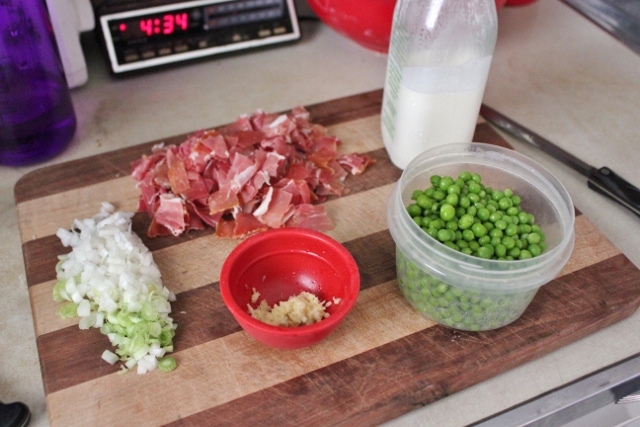 The peas, cream, and prosciutto cost around $20 total. This fed the four of us for two meals. So, at $10 a meal for four people, we consider this to be a screaming deal for what we’re eating! 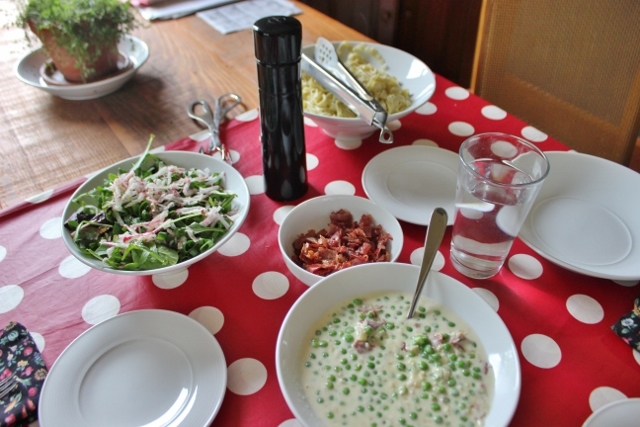 This entry was posted in cooking, recipe and tagged fresh pasta, peas, prosciutto, spring meal. Bookmark the permalink. I suspect this lost a certain elegance when I made it with bacon instead of prosciutto, but it sure was tasty and fabulous! OOH!! Sounds delicious with bacon too! I’m so glad you liked it!